Huh wut? Dangnit I thought I 'shopped all those out of that pic! Er, that one, I mean. That I don't have anymore. Just signed off on this pantry in the new mud room two hours ago. It is already half full of stuff. 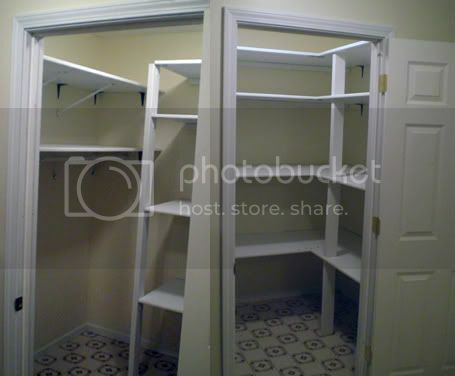 Walk-in pantries are nice; My house isn't nearly big enough for one, though, and I figure if I get to the point where I feel like I have to make additions, I'd rather just sell and move to something bigger. 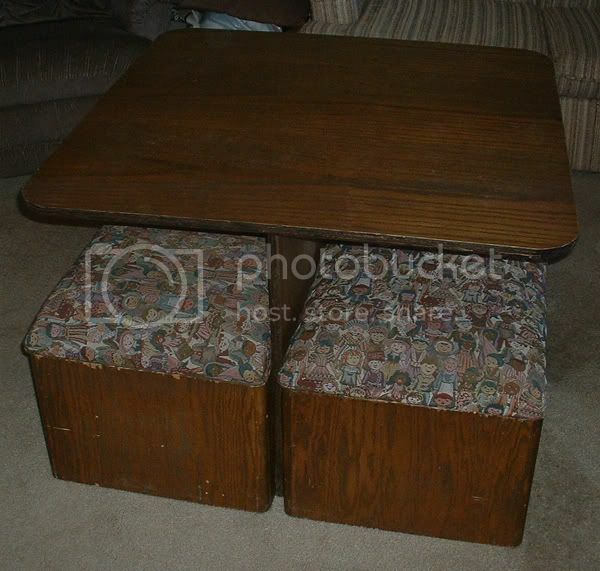 Here's a rumpus room table I crapped out several years ago. 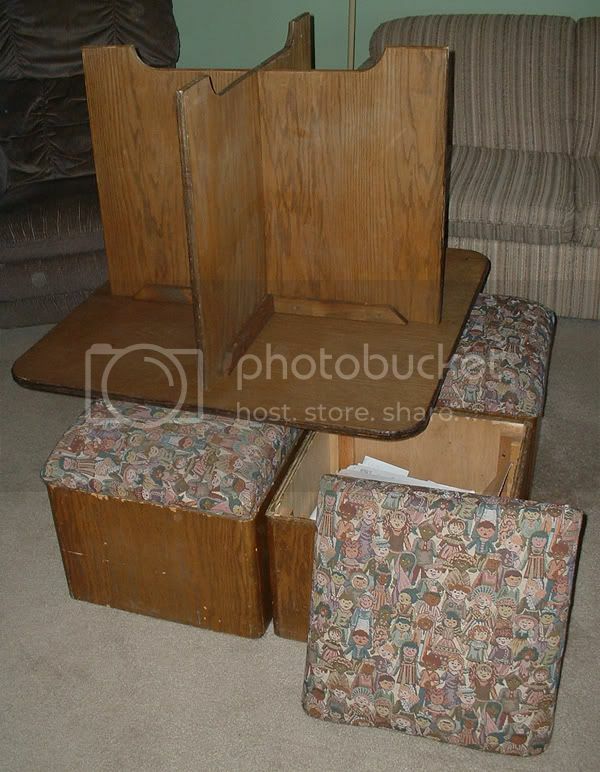 It's 4' square, and the seats/footstools are little chests with padded seats. It's walnut ply with edges skillfully darkened with a propane torch. The large leggage area makes it very sturdy. I didn't notice till I looked at the pix, but it is displaying many signs of rumpustous usage. Ah, well, that's what brown Sharpies are for. If I was a better crafstman, I'd inlay a game surface into it, like checkers or backgammon. Clever little design there, PF. Why thankee kindly. When I made it, we occupied a much smaller house. It was a good space saver. Teh bench in progress. This is actually a couple weeks old, the top is now flattened and attached, and there's a tall cap on the right-hand end there for a twin screw vise. I'm working on dovetailing an apron that will go on the front into the endcap. More pics later. Last weekend's progress, submitted without comment. Your joints: they dovetail nicely. Are you gonna seal the surface, so you don't have to use a coaster for your Dt Pepsi? I had good progress today: I got the moving halves of the two vises cut and milled today, bored all the holes for the drive screws, etc, so the vises are just about ready to be installed. Also got the front apron glued on, so that's the last piece. I can finish the vises tomorrow. All that remains then is to flatten the top and apply a finish. I mean you glued up that whole top? wow..
the best thing i ever made was an ash tray that was condemned by the fair housing committee. This weekend's progress. After this, I won't subject you guys to any more bench photos, it's pretty much done. Much cool, Pup! I can smell the testosterone through my monitor. Sometime, post some pics of the clamps & bench doggies in use. Thanks guys! Although there's some goof-ups on it, and there's some things I would change if I had to do it again, overall I'm rather pleased with myself. Now, on to the *real* projects. First up: A china cabinet for SWMBO! Oh, and you're not missing anything here: Beyond the man-made nuisances of unholy traffic, smog and whatnot, there's always Mother Nature with fire, mudslides, drought and earthquakes. But the weather's usually nice! The weather is dandy in socal. If it's too hot, just drive to the beach & it's ten degrees cooler. I, however, can't leave metallic wares outside in winter , even in the garage: humidity + freezing = condensation. Hey, how about that traffic in socal? What's up with that? :badump: I like visiting there, but I stay put during rush hour if possible. Last time I was there, though, I was driving from San Diego to OC at two in the morning, and got caught in an hour long traffic jam/police road block. They were checking every single car for illegal mexicans! rain, nothing to do but drink and fight according to my irish friend.. Otherwise, I'd have to hire the Puppeh, because I couldn't do this crap.